Meet and hear Frankie talk on Saturday, February 20 - Stay tuned for more details. 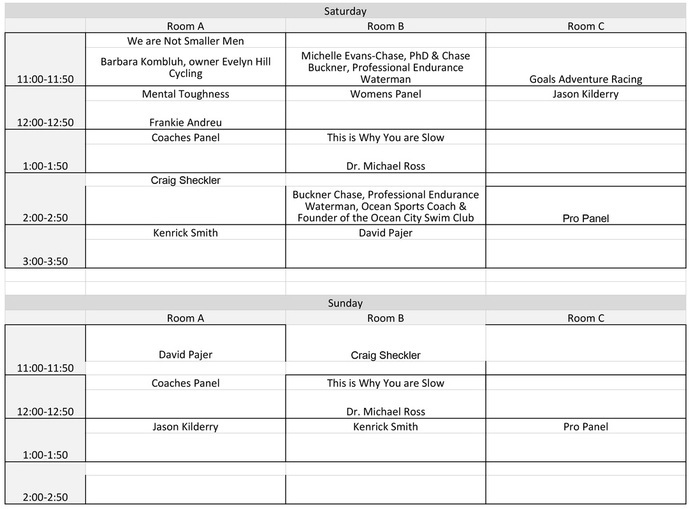 Click schedule below to download a printable seminar schedule. Whether it’s in Runner’s World, Triathlete Magazine, or from your local “certified” personal trainer, you hear something new about strength training every day, usually that it will help with both keeping you injury free and improving your performance. Is this actually true? What about “core exercises,” do they actually work? Should you be doing plyometrics? Will CrossFit help your running? Come join Coach Jason Kilderry as he discusses what strength training approaches are ideal for endurance athletes ranging from newbie to professional to aid in performance and in some cases injury prevention based on the latest scientific literature. Jason has an extensive background in exercise physiology and will help steer you clear of the claims that would be detrimental to your training. With so many ways to train for running events, which approaches are ideal for making you faster? Does changing your technique help? Should you do a lot of high-intensity training? Will running a lot of mileage help? Maybe strength training? Nutrition? Come join Coach Jason Kilderry as he briefly discusses these current areas of interest and what effect they will having on making you a faster runner. Coach Jason Kilderry has an extensive background in exercise physiology and has worked with runners ranging in ability from beginners to Olympic Trials Qualifiers. Michelle researches mindfulness mediation as a means to increase emotional regulation and she joins her husband, Bruckner, whose experiences around the world make him an internationally recognized ocean athlete, coach and advisor whose mission it to positively impact how we feel, think and act towards our oceans. There is no perfect stroke for all open water situations and conditions, but every athlete develop an Open Water Core that will enable them to adapt and thrive in any open water environment. Bruckner Chase is an endurance waterman, open water coach and ocean advocate whose 2010 28-mile swim across Monterey Bay launched the BLUE Ocean International Film Festival and his new career focused on our oceans. As an athlete, coach and founder of the non-profit, Bruckner Chase Ocean Positive Inc, he is committed to moving others towards a personal connection to the water and a commitment to make ocean positive choices to protect our marine environments. 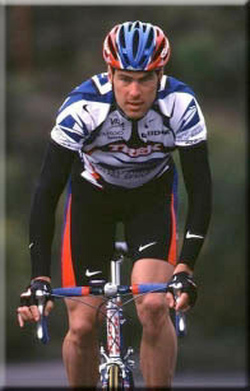 Bruckner's athletic career has included the most challenging of aquatic and land events from his first Ironman-distance triathlon in 1985 to a 100-mile trail run in 1998. Aquatically he has completed ultra-distance swims and paddles in some of the harshest conditions imaginable from wetsuit-less swims around islands in Alaska to historic ocean swims connecting remote villages in American Samoa. Bruckner is currently focused on growing the conservation and community based programs of Ocean Positive, Inc. while training for international lifeguard ironman format races with the goal of competing in the legendary Coolangatta Gold Race on the Gold Coast of Australia in November of 2014. Spring is right around the corner! As you prepare for the coming race season, train smart to race smart. Come and learn proven strategies to improve your performance and avoid life-threatening conditions that can happen to anyone! Every year, hundreds of healthy people become victims of Heat Exhaustion, Heat Stroke, and Hyponatremia. Some have died. Others have been left with severe brain damage. Selecting the proper hydration strategy should not be left up to chance. Changes in the weather should lead you to changes in your hydration strategy. How much electrolytes are in sports drinks? Is it too much? Is it too little? How about sugar, too much or too little? Don’t get carried across the finish line. Bill Gibbons is the founder and president of the GOALS Adventure Racing Association. For the last 10 years, along with his wife, Anne, and a core of dedicated volunteers, GOALS-ARA has conducted 6-hour, 12-hour, and 24-hour adventure races that have gained recognition as some of the best organized and physically demanding competitions in the country. In 2012, Team GOALS-ARA was ranked #2 in the country with the US Adventure Racing Association. Over the last decade, Bill has organized and directed over 100 events. With a background as a search and rescue instructor, Bill is proficient in all aspects of wilderness training. Bill has been involved in search and rescue operations across the country. GOALS-ARA teaches clinics throughout the year on the various technical skills involved in adventure racing, wilderness survival, search, rope rescue, and leadership. As a racer, Bill has numerous podium finishes, as well as some great stories about the races that didn’t turn out so well. Bill is also completing his training at the Philadelphia College of Osteopathic Medicine (PCOM) as a physician. He intends to go into Emergency Medicine upon graduation. How to get stronger in your sport by incorporating SSST into your training schedule. Two survivors and triathletes share their stories of hope, possibility, overcoming obstacles, and giving back. Steve Brown and Derek Fitzgerald talk about their battles with blood cancer and how their multisport lifestyles remain a driving force behind their health, and their commitment to finding a cure and raising awareness. When athletes swim, more often than not, what they think they're doing, isn't exactly what they're doing. Athletic instinct, or the desire for resistance on the pulling and kicking surfaces, sometimes means the additional effort they put into the action, can do more harm than good. Learn how consistent visualization and feedback can help your athletes learn and understand better ways to swim. This presentation will cover the most frequently diagnosed running injuries along with the causes and treatments for each. Dr. Adam Chrusch is a non-operative sports medicine physician who cares for a wide variety of patients, athlete and non-athlete alike. As a former collegiate football player at the Johns Hopkins University he has a special interest in concussion management and care of the scholastic athlete. Dr. Chrusch also has an interest in the care of endurance athlete which, he, himself, is an active competitor, racing distances from 5k to marathon to triathlon. He is a published, fellowship-trained physician, who is a dedicated educator and clinician. He is board certified in Sports Medicine and Family medicine. He is one of the team physicians for Spring-Ford Area High School. In this seminar, Mid-Atlanic Multisport head coach Bill Hauser will discuss important differences between pool and open water swimming, review key open water skills and provide tips and strategies to help reduce anxiety and improve performance during the swim portion of a triathlon. Bill Hauser has been active in endurance sports, both as a coach and competitor, for more than 20 years. He has experience coaching athletes of all ability levels, from beginners to elite-level competitors. Mid-Atlantic Multisport athletes have qualified for and competed in prestigious races throughout the United States and around the world, including the Boston Marathon, Ironman World Championship, USA Triathlon National Championship and ITU World Championship. Elevating women through endurance sports: Lessons in training and racing applied to everyday life. Marcy Gialdo is a triathlon and endurance sport coach working with athletes in Philadelphia and all over the country. She is the founder of WAVES, an all woman’s racing team. She has been competing in the world of endurance sports for 15 years, is a certified USA Triathlon coach and has experience coaching all-levels, from the beginner runner to the athlete who is seeking a podium finish. As a mom of two school-age children, she strives to help athletes achieve their personal bests while maintaining the ultimate balance of family and sport in their lives. Dr. Johnny King-Marino has been practicing for more than thirty years. He has successfully completed eight Iron Man races, and twice qualified and competed at the Hawaii Ironman Championship in Kona. Dr. King-Marino has been practicing for more than twenty-six years. He works with the Kenyan Running Team and has been the Team Chiropractor for the USA Triathlon, LaSalle University, and many local high schools. Dr. Johnny is a Certified Sports Physician and is also marathon runner. He is experienced with Active Release Technique, Graston Technique and a host of other soft tissue modalities. He is a frequent lecturer both nationally and locally. He works with the Kenyan Running Team and is the Team Chiropractor for the USA Triathlon, LaSalle University, and many local high schools. Dr. Johnny is a Certified Sports Physician and is also completed six marathons with a PR of 2:37 at age 41. He is experienced with Active Release Technique, Graston Technique and a host of other soft tissue modalities. He is a frequent lecturer both nationally and locally. Athletes have plenty of aches and pains - from hard training, accidents, injuries, etc. We will review what inflammatory foods do and how they inhibit your performance, recovery and cause pain. We will review pro and anti-inflammatory foods so you can know the difference! Should you try a Wheat Free Plan? Athletes want performance. But wheat can inhibit your performance, cause weight gain, brain fog, ADD, sugar cravings and injuries. Learn why you may want to try a wheat free diet. Alternatives to wheat will be reviewed. NRT session will be demoed.